Every once in a while you just need a quick, cute romance. And that's exactly what this book was. I am back with another review, today it is Going Pro: Touchdown by Ashlyn Hope. Thanks so much to the author for providing me with an e-copy of this book for an honest review, as always, all opinions are my own. The story follows Prudence, or Pro, as her friends call her. She's recently gotten her massage therapist certification and has moved to the big city. She's struggling enough trying to make ends meet and after a brief 'relationship' with a jerk she met online, Pro's not sure things are going her way. 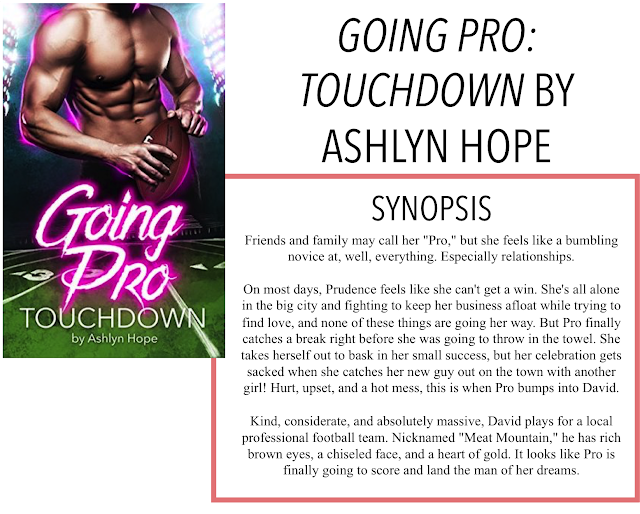 But then Pro bumps, literally, into David, a football player with a kind heart. A relationship quickly develops between the two and Pro wonders if finally, things are turning in her favour. I think that overall, this was a pretty good story. I think my main critique lies with many elements that could be fixed by extending this novel. By my copy, it was only 77 pages long. That didn't leave a lot of room to develop characters, relationships, storylines, etc. I don't know much about Pro, where she's from, what she really looks like, why she is the person she is. There was much more that needed to be included to fully flesh out the story. I will say that despite this, the story has good bones. Pro seems like a nice enough character, but I don't know much about her. I think there could be a good relationship with David, who seems like a genuinely nice, non-jerkish guy, but the book is just too short to get to the meat of these details. There's a lot to build on in book two, but part of me thinks that maybe they should be put together to make one longer book? The writing of the book itself was largely well done. There were a few moments that felt a little awkward, things being told, not shown, but that comes with practice. It was a good attempt for a debut novel. I also felt like things were just getting good and the story ended, but I guess I'll just have to wait for book two. Overall, a solid debut and a series I look forward to continuing!